https://matcha-jp.com/en/5508 CAFE Osaka Chakai - Taste Delicious Freshly Ground Green Tea In Osaka! CAFE Osaka Chakai - Taste Delicious Freshly Ground Green Tea In Osaka! CAFE Osaka Chakai, located in the Tenjinbashisuji Shopping Street of Osaka, is a chic café where you can enjoy tasty tea in exquisite tea bowls. We’ll introduce the organic tea types, the delicious sweets and other highlights of this charming cafe. Osaka is an increasingly popular destination among international tourists. It seems that there is a specialty tea café filled with originality in this city that has captured the hearts of those who visit. We decided to pay a visit to this café together with Ms. Evelyn who adores tea. 7. Have a Happy Time at CAFE Osaka Chakai! CAFE Osaka Chakai is located on the Tenjinbashisuji Shopping Street in Osaka. Known as Japan’s longest shopping street thanks to its length of 2.6 km, it is a bustling area where you can find all kinds of products - from daily necessities to Osaka’s delicious foods such as takoyaki. Osaka, often called the “Nation’s Kitchen”, has been famous ever since the Edo period (1603 - 1868) as a place where delicious foods from all around Japan could be found. Around 400 years ago, the Okawa River, a river that flows south of the shopping street, was visited by boats that carried agricultural produce and marine products. To this day, there are shops from that period that continue to operate on the Tenjinbashisuji Shopping Street. Immediately east of CAFE Osaka Chakai is also where the one thousand year old Osaka Tenmangu Shrine is located, making it a place where you can truly feel the history of the area. There are also sightseeing spots such as the Osaka Museum of Housing and Living, a museum that has recreated the townscape of the Edo period, on the northern end of the Tenjinbashisuji Shopping Street. To the south is also an area where you can board water buses and enjoy the streets of Osaka which flourished as a water capital. Walk about 2 minutes from Minami-Morimachi Station (Osaka Municipal Subway) or from Osaka Tenmangu Station (JR Tozai Line) and you will find a shop with noren curtains hung at its entrance to the left of the road. That shop is CAFE Osaka Chakai and is where you can have your fill of Japanese tea and pottery. CAFE Osaka Chakai is a café that was opened in August 2016 by an owner who loves tea and pottery. The event that triggered the opening of the shop was when the owner was asked by an American friend visiting Osaka where they could find a café where they could both relax and enjoy Japanese tea. She found that there was no such shop that she could recommend. As a result, she thought of collecting high-quality Japanese tea and pottery to create a space where visitors would be able to relax. At this café, there are English-speaking staff members, so you won’t have to worry even if you don’t understand Japanese. You can even ask about ways to best enjoy the menu and tea in English! The interior is designed to be like a retreat in the heart of the city. An idea that draws inspiration from the art of Sen no Rikyu, a master of tea ceremony (or “the way of tea”) that was born and lived in Osaka more than 400 years ago, this theme refers to creating a quiet place that is like being in a mountain retreat despite being in the city. Just as these words describe, this café is a chic and calming space that you wouldn't think you could find in a bustling shopping district. The shop has an original interior with a modern and casual atmosphere and elements of Japanese design. You can, without a doubt, spend your time comfortably here. 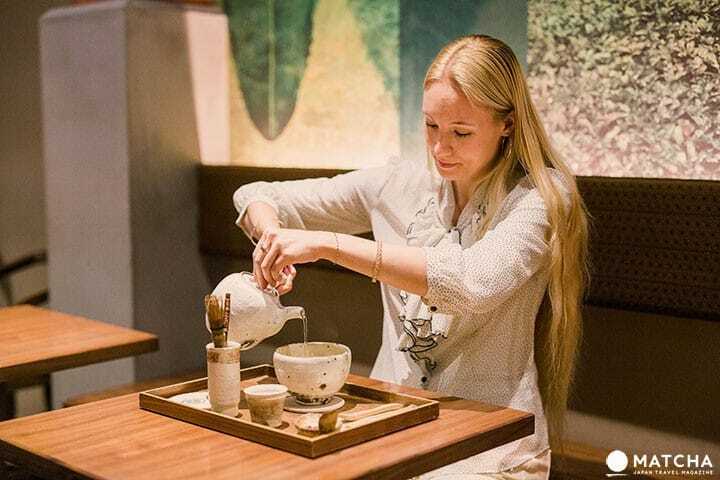 “The purpose of this café is to have the guests spend their time blissfully tasting delicious tea in high-quality bowls like those used in cha-no-yu (*1). For that reason, we have collected original bowls made in the Tokai region which boasts many excellent potteries”, told us the owner. *1 Cha-no-yu: another name for a tea ceremony. “Choice shelves” lined with approximately 100 masterpieces directly purchased from potters are found under a map with Japan's pottery-producing areas. On these shelves you can see a wide variety of tea bowls, from traditional bowls that represent the “wabi-sabi” style, which exudes a quiet and refined beauty, to pop style, fashionable cups. In addition to the choice shelves, there are other shelves with tea bowls that are available for sale. If you find a charming tea bowl that you like, you can purchase it on the spot! After ordering your drink, you can choose your favorite cup from the choice shelves. There are so many beautiful bowls that many customers find themselves at a loss not knowing which one to choose. When you can't decide, you should take a good look at the colors of the tea bowls that you like and touch them to see how they feel in your hands. Ms. Evelyn found a cup that caught her eye. “This cup is white and simple, but has a beautiful design”, she said. Her choice was a Hagi tea bowl made in Yamaguchi. Using this beautiful bowl, she indulged in the menu called Freshly Ground Green Tea Self Mixing. Through this menu, you can enjoy the unique fragrance of freshly ground green tea in the shop. The Freshly Ground Green Tea Self Mixing menu (594 yen plus tax) is one way to enjoy CAFE Osaka Chakai’s original tea by pouring hot water onto organic tea leaves that are ground into a powder using an electric stone mill. You can choose from four types of tea leaves produced in Japan's famous tea production areas. The tools used in the Freshly Ground Green Tea Self Mixing menu have been chosen carefully. The tool that is used when mixing tea together with hot water is a muddler tea whisk adapted from the chasen* that is used in tea ceremonies. These whisks are made by a tea whisk studio in Nara that has been manufacturing tea whisks for 500 years. The four types of tea available include the gentle and refined flavored Wakayama Tea, the very fragrant Asamiya Tea, and the reputedly delicious and sweet Tanba Tea. All teas have different but great qualities. The most popular tea is the Kagoshima Tea, which has a deep, full-bodied flavor similar to that of coffee. We are happy to note that all tea leaves are organic and can be consumed without worry. Ms. Evelyn selected the Kagoshima Tea. A short while later, the green tea and tea utensils were prepared. She was first entranced by the fragrance of the tea leaves. “They have such a nice fragrance!” she exclaimed. The tea leaves, which are ground upon order, have a much fresher fragrance than regular green tea. First, scoop out powdered tea with the bamboo tea spoon for two to three cups and pour it into your tea bowl. Then, you'll be pouring in hot water. You can control the amount of hot water and make your tea however strong you like. You can enjoy about two to three cups of tea from this menu, so it would also be great to try out various consistencies. After mixing it with the muddler tea whisk, the tea is ready. There is nothing overly complicated to the process, so the tea can simply be enjoyed. It seems like she was completely satisfied with it. “It’s great being able to make tea by using a muddler tea whisk and refined cups like those found in tea ceremonies!” she added. We were told that there are international tourists who come back to visit numerous times during their stay after being charmed by the deep flavor of the tea that can only be found here. There is also a “Just One Cup” menu (486 yen plus tax). The staff will make the tea for you. It is a menu for those who would like to enjoy just one cup of flavorful tea. The large bookshelves that reach the ceiling in the shop are lined with books related to Japan, Osaka culture, and art. The famous “THE BOOK OF TEA”, a book that introduced tea ceremony to the West for the first time when it was published in America in 1906, and its Japanese version, are also among these books. CAFE Osaka Chakai also offers lattes, mixed juices, shakes, and desserts made with green tea and hojicha (roasted green tea). Premium Zenzai (red bean soup with mochi soft rice cakes), the most popular dessert at CAFE Osaka Chakai, is one you’ll want to eat during the cold season. The Zenzai with two pieces of mochi as shown in the photo costs 1134 yen plus tax. If you wish to have just one piece of mochi, the dessert will cost 1026 yen plus tax. Bite-sized mochi rice cakes, made using domestically produced brown rice, are served together with zenzai red bean soup mixed with freshly ground green tea. It’s a dessert with the perfect balance of sweet and bitter. If you want to have a menu full of sweets, then we recommend the CAFE Osaka Chakai Amami Grande (1188 yen plus tax). This dish is popular among international customers because you’re able to taste tea sweets such as green tea soft serve ice cream, panna cotta, and daifuku rice cakes all in one dish. The Osaka Chakai Monaka (wafer cake with bean jam) has mascarpone cheese inside and is a new flavor that mixes Japan and Western flavors. It also goes well with a green tea drink. If you like a milk base, then we recommend the Creamy Freshly Ground Green Tea Latte and Creamy Freshly Ground Hojicha Latte (both 540 yen each plus tax) made using only milk and freshly ground tea as ingredients. Hojicha, green tea that has been roasted in the shop, has an exceptional flavor and fragrance. There are several souvenir products that you can only purchase here at CAFE Osaka Chakai. Tea bowls or cups (1000 yen and up plus tax) that are purchased directly from the potters are one example. There are original, stylish works of art lining the shelves that aren’t sold at any other shop. Many customers purchase a cup to remember their visit by. Other very popular products are the pesticide-free teas (540 – 1200 yen plus tax) sold in beautiful packaging, CAFE Osaka Chakai’s original chocolates (270 yen and up plus tax) by the famous Osaka chocolate brand Ek-Chuah and the freeze dried red azuki beans (small 205 yen plus tax, large 410 yen plus tax). Origami flags (432 yen plus tax) are also especially popular souvenirs among international visitors. There is a total of 24 flags designs available including the flags of The United States of America, England, China, and Taiwan. Some of the customers like to fold origami in the shop while enjoying their tea. Various sweets and Japanese paper postcards from all around Japan are also available, so please take your time to check out all the souvenirs when you visit. Happy Time at CAFE Osaka Ch◯akai! CAFE Osaka Chakai is currently a place that offers its guests a happy, leisurely time of tasting delicious tea in wonderful bowls. Designed to be a “retreat in the heart of the city”, this cafe is the embodiment of the owner’s hope for customers to relax and gain new inspiration in this space. Enjoy Matcha Sweets at Modern Japanese Tea House "nana's green tea"